In recent years, business schools have enjoyed a boom in applications from students coming from the oil and gas sector who face the threat of redundancy. The slide in the price of crude oil, from $115 a barrel at its most recent zenith four years ago to a nadir of near $20 in 2016, has led the major energy companies to slash jobs, including Halliburton, Schlumberger, Shell, and Chevron. In 2017 more than 440,000 oil and gas workers globally had lost their livelihoods since the downturn, according to a report by the consultancy Graves & Co. The oil price has settled at about $70 today. The tougher climate for oil and gas workers has been good news for business school admissions teams, but has required that careers departments adapt to the new job opportunities that are on offer for MBAs. Schools say applications from oil and gas workers spiked between 2014 and 2017, and have now remained fairly stable. What has changed recently is that MBA candidates from the oil and gas sector are looking to move around within it, rather than leave the industry entirely. Roughly 20% of the Global Online MBA cohort at Imperial is from the energy sector and many of them are working full-time jobs, she says. Many of them see business school as a way to plan for industry change and give themselves an edge as the sector evolves, Crystal adds. Energy companies are investing in clean energy solutions such as tidal, wind and solar power, for example, with renewable energy now accounting for one-quarter of the UK’s energy needs. Meanwhile, workers in the sector are having to get to grips with new technologies that can improve power quality, lower operating costs and reduce carbon emissions. 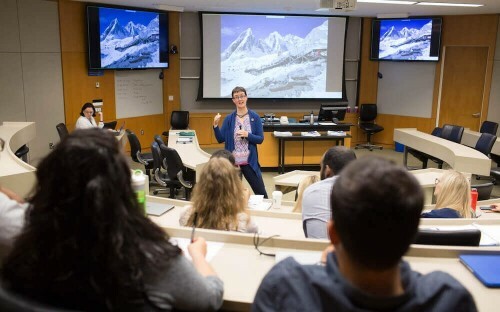 Katie Kross, managing director for the Center for Energy, Development and the Global Environment at Duke University’s Fuqua School of Business, says: “The energy sector is an exciting place for MBAs right now, because it is both so vital to our economy and so dynamic. She says that there has been no slowdown in MBA hiring across the industry— oil and gas, utilities, renewable energy development, energy finance and consulting. Some of this year’s graduates, for instance, went to Chevron and ExxonMobil, but others went to NextEra Energy, National Grid, ScottMadden, Siemens, and Tesla. Katie notes that the MBA prepares candidates to adapt to change and to be mobile. “Between their MBA training, quantitative abilities, leadership skills, and energy-specific industry expertise, our graduates are prepared to be top candidates in any of the energy industry verticals,” she says. “Our value proposition to students is that they will not be locked in to one particular energy perspective, but will be prepared to be great leaders anywhere in this rapidly-changing sector.